Summer is Here with the Seasonal Salted Caramel IsaLean Shake! 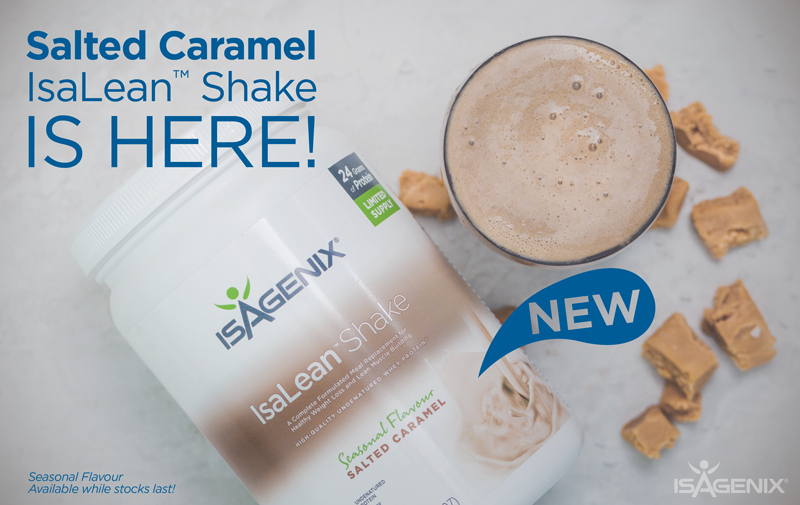 Our seasonal IsaLean™ Shake Salted Caramel has arrived! The perfect combination of sweet and salty, this irresistible summer favourite will have you coming back for more. Available for a strictly limited time only, this healthy and delicious meal replacement is guaranteed to be a hit! Take a break from the norm and mix up your routine with this classic favourite. With the same nutritional value as all our other regular IsaLean Shakes, you’ll wish you bought more! So, what are the benefits of this convenient and complete meal replacement that everyone can enjoy? Keen to get your hands on it? Stock is limited! To avoid disappointment, visit your Back Office to place a Wholesale order or jump on your IsaOrder App to make your purchase today and get ready to create a memorable summer with IsaLean Shake Salted Caramel. If you’re just as excited as we are about our tasty seasonal flavour, get snapping and hashtag #saltedcaramel to show us how much you love the new IsaLean Shake Salted Caramel! Tag us on Instagram at @IsagenixANZ and you could be featured on our page! This product is not available on Autoship. Check out this article if you’re unsure about how to place a Wholesale order.